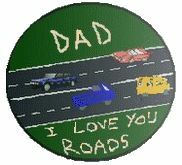 Dad is sure to be delighted with this “I love you roads” magnet for Valentine’s Day, Father’s Day or Christmas. Of course, you don’t need a special occasion – why not give this to Dad just because you love him! Paint the circle green and let dry. Take a ruler and place it across the circle. Draw a line on either side of the ruler. Paint black inside these lines and let dry. Paint a white line outside of the black area, and down the center. Paint white dashes down each side of the road and let the paint dry. Stick car stickers along the road. With permanent marker, write “I LOVE YOU ROADS,” for loads. Mix white glue with a little water and paint this mixture over the entire circle to seal and provide a gloss effect. If using a juice lid as a frame, glue the picture inside the juice lid rim.